The Pahrump Valley Junior Trojans Wrestling team was at the Rattler Roundup on Dec. 14 at Mojave High School and took third place overall. The competition was stiff with close to 445 wrestlers there. 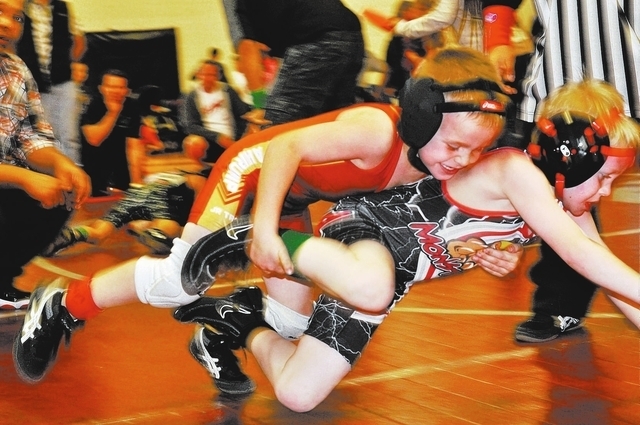 In the past, the Pahrump Valley Junior Trojans have sent 10 to 12 kids to large tournaments. Those days are gone. Junior Trojans Coach Ray Cortez said participation for the tournaments are on the rise and this is helping the Trojans score better. He said the team had 28 kids that went to the tournament last weekend and this has steadily increased over the years. “We usually have 15 kids. These tournaments are scored depending on the size of the bracket. The bigger the bracket, the more potential team points the kid can score. You can only score the top 20 kids from your team. In years past we were not able to get 20 kids to score the maximum. This year we have more than enough,” Cortez explained. The coach named Caden Briscoe as the Junior Trojans wrestler of the week. “He got the fastest pin of tournament,” he said. Cortez said the Trojans placed third overall and the coach credits his team’s dedication and hard work for placing so high. “One thing I noticed about the weekend is the kids were trying new and different moves. In the past we had wrestlers who were set in their ways and they did the same stuff that worked all the time. For those wrestlers, it will come to a head where those things won’t work all the time and you have to be able to switch up and go to the next move. I have seen some experienced kids and some new kids working moves that we have been practicing during the week and the previous weeks. I think this is a big factor for getting all the wins we got. The team is willing to go out and try new moves,” he said. The Junior Trojans will be at the Holiday Classic at the Las Vegas Convention Center this weekend. Rookie Division: Pre bantam 38-41 pounds: Samuel Mendoza 3rd, 45-51 pounds: Piper Davis 1st, 45-49 pounds Alexander Mahoney 6th; Bantam 43-46: Caden Briscoe 1st, 50-55 pounds : cameron briscoe 4th, Joseph Barton 2nd, 56-61 pounds: Brennen Benedict 1st, 67-75 pounds: Blake Westcoatt 1st; Intermediate-59-63 pounds: River Cabble 4th, 64-69 pounds: Ryan Valentine-Stimpert 2nd; Novice 82-87 pounds: Isiah Portwood-Encinas 2nd; Rookie middle school: Brayden McKeough-Williams 80-84lpounds, 2nd; Varsity Division: Bantam 44-50 pounds: Donald Davis 2nd, 51-56 pounds: Cameron Briscoe 4th, 57-64 pounds: Brennen Benedict 2nd, 67-75 pounds,: Blake Westcoatt 3rd; Intermediate 53-58 Gunner Cortez 2nd, 117-120 pounds: Rhyon Maher 2nd; Novice 71-74 pounds: Coby Tillery 3rd, 87-90 pounds: Dylan Wright 2nd, 110-118 pounds: Darin LeGrand 1st.